In the Miele kitchen, a light panel up to three metres in length evenly illuminates the working area while creating cosy atmospheric light at the same time. 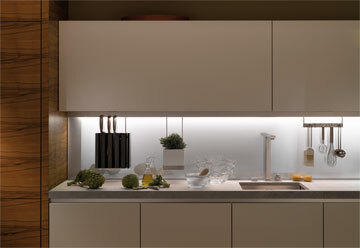 The light shines indirectly onto the worktop so as not to dazzle the eyes. An array of useful organisational accessories hangs at variable points from a profile rail. Always at hand, they establish order and clarity in the kitchen. A minimal construction depth and hanging elements keep the worktop clear and with a material combination of stainless steel, flush-mounted glass, wood and ceramic, they accentuate the high-quality elegance of the light panel. 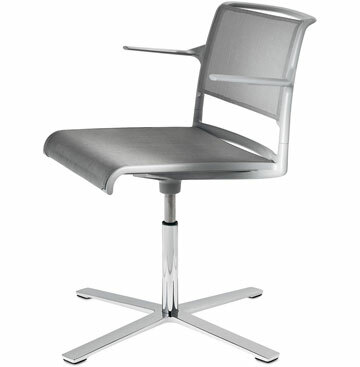 After the initial introduction of the Aline skid chair in 2004, the programme with counter, swivel and office chairs as well as regular, side and stand-up tables has been further developed so as to make up a complete family. Aline is suited for the setup of in-between areas, i.e. furnishing of spaces used for both informal and professional purposes. This includes, for instance, salerooms, consultation spaces, waiting areas and bistros, libraries and Internet cafés, as well as dining spaces and the home office. The design pursues a graceful slim concept, which stands out due to its aesthetic quality, seating comfort and sophisticated functionality. With its reserved, clear language of forms, the Axor Citterio single-lever bathtub mixer with upright installation symbolises a special kind of comfort, which only becomes apparent at a second glance. The bathroom is a place of tranquillity and relaxation. Water becomes a life element, and cleaning a ritual. The design of the Axor Citterio single-lever bathtub mixer reflects this approach. Straight surfaces and round elements are combined, giving the 1,081 mm high mixer a harmonious impression. Light reflections on the surface of the bathtub mixer with joystick cartridge create interesting effects, which are reminiscent of a jewel. A sleek and curvaceous form of the Tantalo bottle opener provides an ergonomic grip and at the same time it communicates a sensuous language, which almost tempts the user to pick, hold, feel and enjoy the form. A coloured detail inside the opener adds a drama and interest visually as well as it directs the focus to the real function (of opening) of the product. Tantalo is made of 18/10 stainless steel. The Scala bathroom and living room mirror combines stimulating interior design and the expression of individuality with the functionality of a mirror for make-up and cosmetics. The design uses a puristic language of forms, which harmoniously fits into any interior style. A light, which is located at the upper edge behind satin-finished glass, diffuses warm white neon light to optimally illuminate the face. 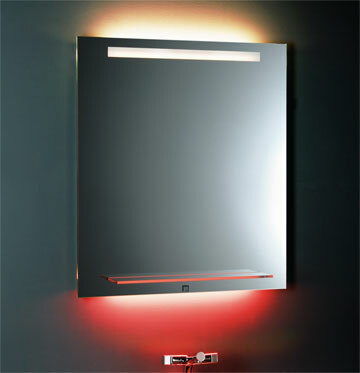 A fine band of light that is integrated into the glass shelf can be switched on additionally. This is available in red, green, blue or warm white. The lighting concept was created without the use of glass fibre and LED technologies. 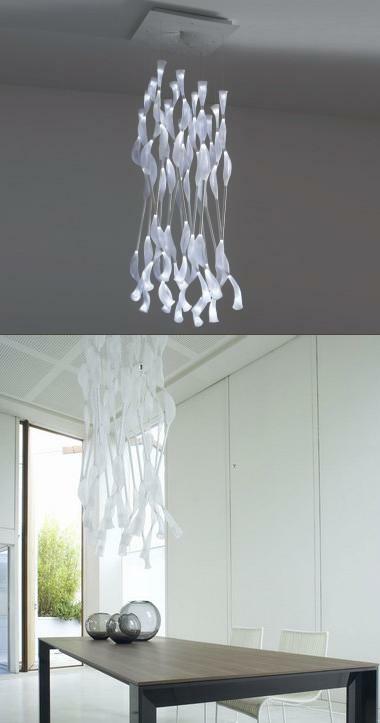 The aim was to create a very low diffusion of the ambient light, in order to not distort perception. A special look of the Mindoro curtain fabric results from its sophisticated craftsmanship. 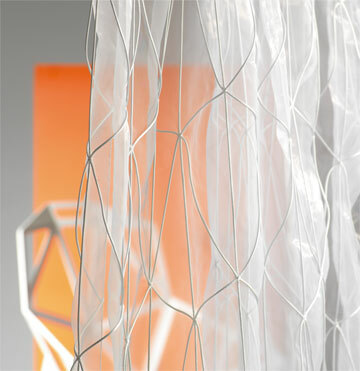 On a white, matt voile ground, coarsely-woven cord threads float lengthways and in both diagonal directions. The white cord threads are connected with the base fabric only at the intersections towards which the cords are running. This gives it a net-like appearance, which together with the fine voile creates a vivid and three-dimensional look.